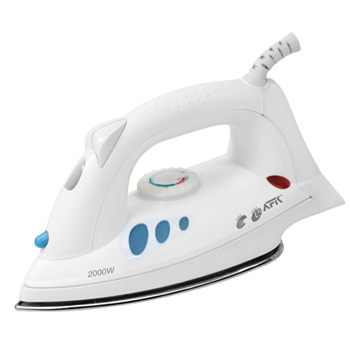 This is my favorite iron, the AFK DB2000, I got it as a gift but I really like the design, and the fact that it doesn't have any teflon coating that I could scratch off, so I can iron my stuff and enjoy it instead of ironing in fear. The see through water tank in light blue and the curves which make the body of the iron are just great. I do not own any sculptures, but I feel like I do every time I look at it. The only thing I do not like in the way it looks is the button near the steam buttons. The lid for the water compartment has flaps making it easy to open with your fingers, not with your nails, and the iron heats up very quickly, but not too much, and that is something that is also important to me as a beginner in ironing various types of clothes. It also holds the heat for a very long time, and when I iron my jeans I always fear that I will burn something, since I burned my fingers a couple of times, but I guess the temperature is made adequate to avoid that because I haven't burned anything with it yet, not even easily burnable stuff made from synthetical materials. I guess it is because the iron has a protective layer of some sort on it's contact surface, it is invisible until you scratch it with some metal object, like buttons on jeans, i did that and it bothers me that the stainless steel can get scratched so I am now very careful when ironing around buttons.